Animals do the funniest things! Use a Misc Me to capture the day to day moments. Misc Me makes it so easy to journal all those funny stories. I have been a cat lover for as long as I can remember and we have also always had cats ourselves. Some time ago I started a Misc Me album that contains all things that make me happy and of course I couldn't help including our beloved cats in it as well. 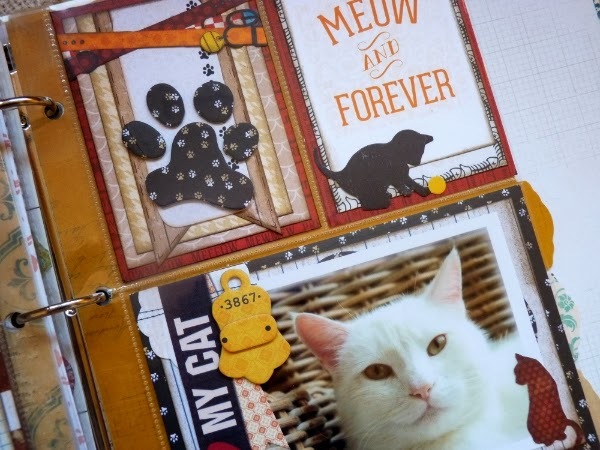 The Happy Tails collection and the Misc Me journal cards that come with this collection were just perfect for making a few pages about our cats. 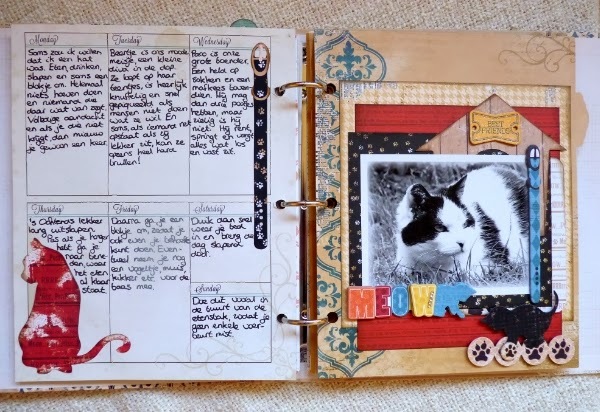 I actually used the weekly journal page to document the daily things that our cats do, which usually consist mainly of sleeping and eating. 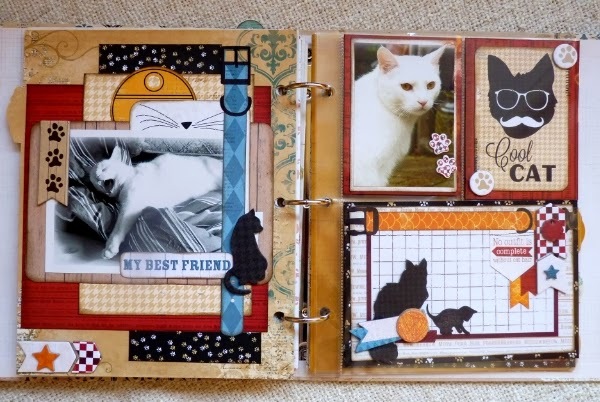 I also journaled about a few things that I love about our cats to document this for the future. 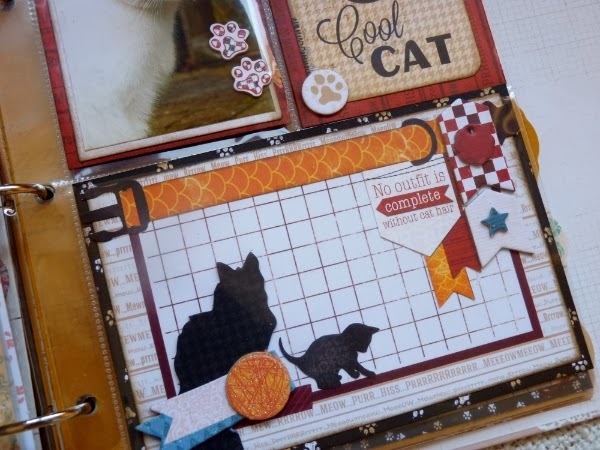 I always like to work with embellishments, but it's better not to incorporate too many thick embellishments on the journal cards that are inside the sleeves. Therefore, I decided to use the Misc Me Dividers (from the The Avenues collection) to make small lay-outs in my Misc Me album. On these pages you can work with more depth, whereas I went for a less layered look when working with the sleeves. I actually mixed the Misc Me journal cards with papers from the 6x6 paper pad. 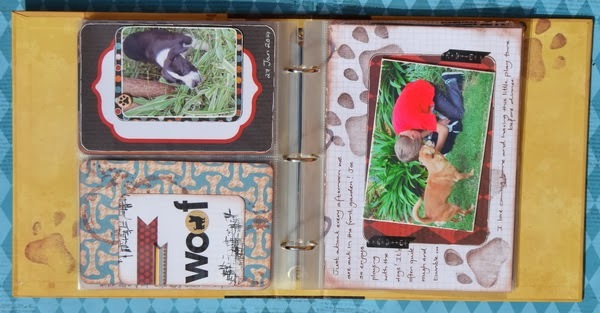 I did some layering with the papers and also cut out several images from both the journal cards and the papers for a nice look. I have a lot of random snapshots of our cats, such as the two above. 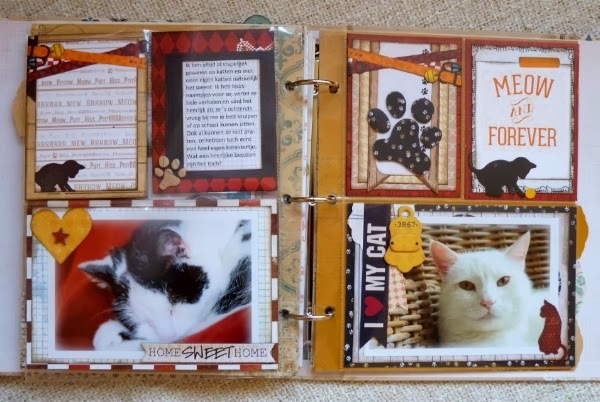 I usually don't think they are pretty enough to use for a lay-out, but they appeared to be just perfect for my Misc Me album, which is meant for scrapping those daily moments that make life so special but are often forgotten. We got a puppy in January and so this Misc Me project was just perfect for me. So this is also the reason for the title of my new Misc Me file - And so there was 2 - because we now have 2 doggies. They are the 2 you see playing on the cover. I want to document Blossom's life and show her growth and development. Our animals become part of the family and really are such a big part of our lives! 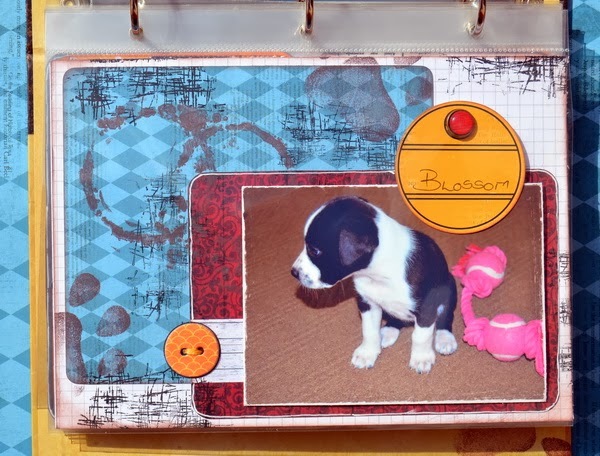 My first page is of the very first day that Blossom came to us. She was really very small and I think was quite lost without her Mommy, brothers and sisters and just looked so very sad! We loved her from that very first moment and she has crept into our hearts. 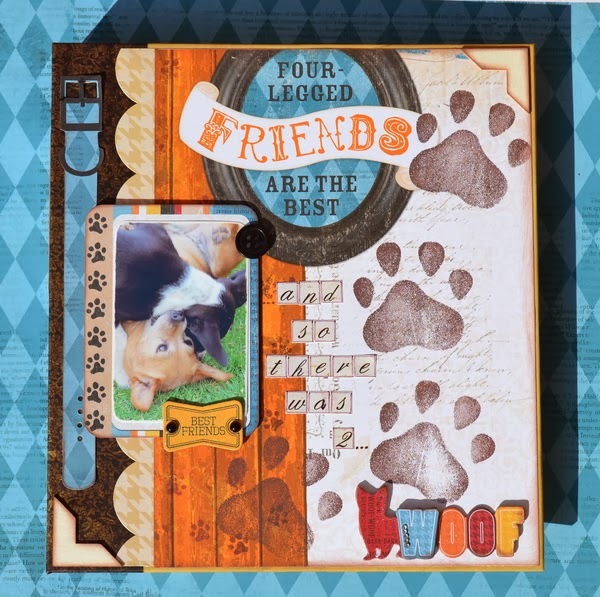 You will see that on the cover and throughout my binder, I have used a wall stamp of a paw print, which I have had for ages, but never used, until now. That's the great thing about crafting, you can use all sorts of things to compliment your projects. The Misc Me cards are so awesome and I really loved these Happy Tails ones. There really are so very cute and really make documenting so fun and easy. 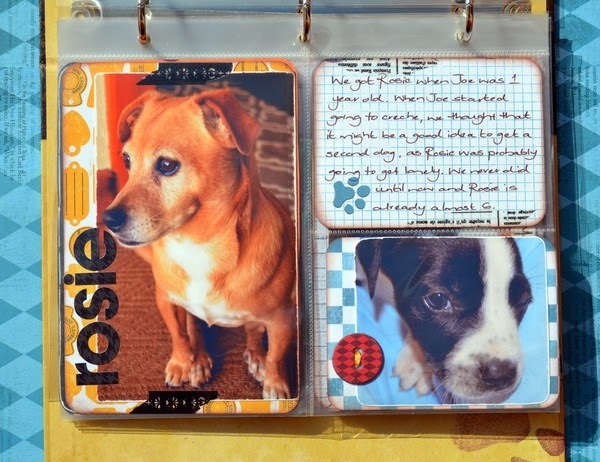 I have used some journalling papers as well as journalling cards and the mix and match works really well. 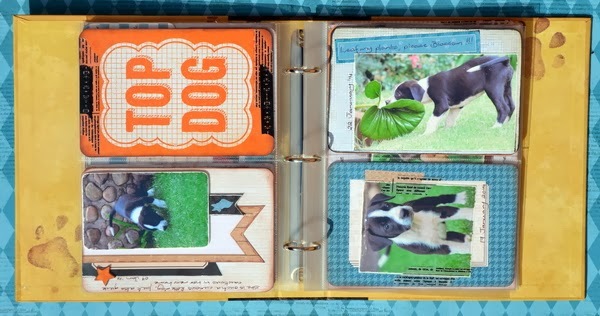 I have used the fabulous new BoBunny washi tapes on many of my pages too and so love how it creates a feature, without adding bulk. Please pop over to my blog if you would like to see more of my pages. Such super cute pages!! I loved seeing your furry friends! Fabulous works ladies! So cute! Your little buddies are showcased so sweetly!